Ensuring our customers’ success and satisfaction are among the most important tasks here at 2BM. We will go to great lengths to provide you the best possible support. Therefore, it has always been crucial for us to ensure a consistent and efficient support of high quality, which is also flexible in the way that we always aim to be present whenever and wherever you need us. Besides being an IT and consulting company, that daily strives to ensure the highest quality in delivery, we at 2BM has also chosen to have a dedicated service and support organization working exclusively to serve you the best. We offer local expertise supported by a network of international technology resources, so that you – wherever in the world you are located – know that we fully understand your needs, wishes and requirements, and that we can work in full compliance with local rules. In practice, this means that our employees are a team of consultants and specialists who are all solely dedicated to providing support and service to our customers – 24/7/365. Our employees guarantee that you always get targeted support from experts with a detailed knowledge of your world – not only to the techniques and the technology behind SAP and other ERP systems. Delivered by a certified team of specialists, whose sole task is to serve you 24/7/365. This is your guarantee for expert knowledge of the highest quality. An important parameter of our Service Center is that we strive to support a simple process in every way, which allows you to focus on your core business and let us handle your technical issues and technological challenges. 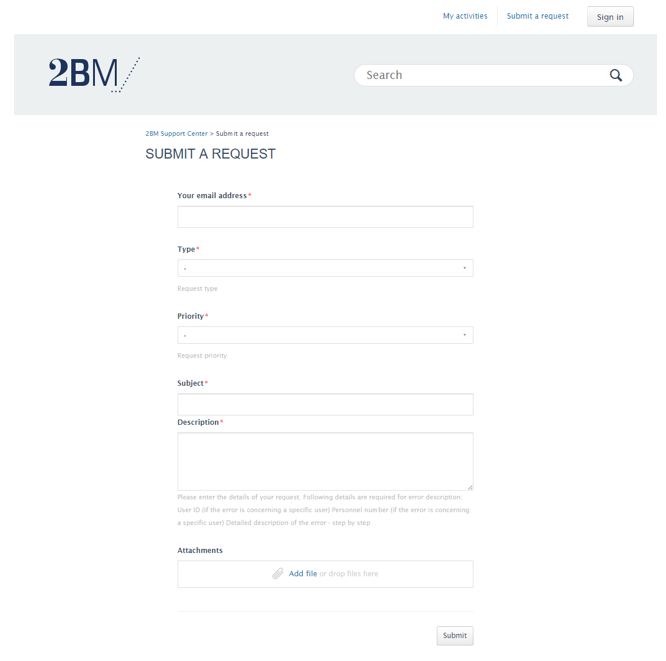 Therefore, we give you and your employees the opportunity to send emails about your technical concerns directly to our Service Center via support@2bm.com. Simple and fast,user-friendly and efficient. The 2BM service Center system is Zendesk. 2BM have chosen Zendesk, because it streamlines your support with time-saving tools like ticket views, triggers, and automations. This helps you get straight to what matters most — better customer service and more meaningful conversations. Your company’s individual SLA (Service Level Agreement) ticket priority will be continuously monitored so that you can follow how the solution proceeds hour by hour. This, combined with a full historical data summary and weekly and monthly detailed progress reports and meetings, allow you to analyze what areas of your business need the most support. In addition to living up to our own high quality standards, we are also PCOE certified by SAP, which means that we have been through a rigorous evaluation and certification process to be appointed as the Partner Center of Excellence. We are proud of this quality mark that the certification gives our processes, systems and employees, and is your guarantee that our Support Center provides full support and maintenance of SAP products and solutions. 2BM is a full service provider within Human Capital Management, including HR administration and Payroll. Several customers have already outsourced their HR delivery function to 2BM. 2BM Service Letters contain the latest KMD Nettoløn support packages. WANT TO KNOW MORE about how you can dedicate as many resources as possible for your core business by letting us handle your technical support? Please contact us for an informal meeting. Arla decided to bring back all their IT processes inhouse to optimize their processes and have better steering and control. The solution at Arla helped them manage day-to-day Support and Change Requests in an ever-changing environment. Key insights from SuccessConnect 2018 in Berlin. We have heard about machine learning for a while now – but it is here and the first features are released in Q3. Design Thinking is becoming quite the buzzword and companies across many different fields have or are beginning to incorporate the approach into to their businesses. Join our 30-min webinar Wednesday, 26 September. We will cover recruitment tools, trends and technologies, and how it all plays into SuccessFactors. The United VARs Annual Meeting is coming up, and we thought we would recap last year’s Annual Meeting!